We are proud to offer our existing and new patients that do not have insurance a discount dental plan called New Dental Choice With this plan you will get the same, high quality dental care at a price you can afford. 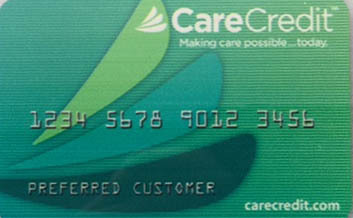 As a service to our patients, we are pleased to offer CARE CREDIT, the nation's leading patient payment program. For fees from $300 to $25,000, upon request and approval, CARE CREDIT offers a comprehensive range of plans with low minimum monthly payments that fit comfortably into every budget.